Amid extreme financial market volatility swings and talk of US stimulus plans, the US Dollar finished out a second consecutive week in the red. Yet, despite the past few weeks retreat, the currency’s larger three-month bull trend is still dominating the landscape. That technical view matches the fundamental backdrop. While there have been a few headlines and updates to cool the Dollar’s exceptional climb, there hasn’t been enough of turn the tides back towards the bear’s favor. Moving forward, the anxiety of a fragile gobal investor sentiment, a reinforced path of monetary policy and a possible second wave decline for the the Greenback’s largest counterparts will all support the currency’s medium-term view. When liquidity returns next week, the first concern for market participants will be the bearings for broader sentiment. Investor confidence passed through two stages this past week. The first half was dominated by heavy selling in capital market assets that confirmed an important break that ended the previous week. Yet through the second half, a rebound for the higher return / higher risk segment and retreate for safe havens developed. In fact, through this heavy swing in confidence, the US currency never seemed to truly find grip through its safe haven status. There is a difference between an unfavorable move in capital markets and a motivated ‘risk unwind’. The latter speaks to conviction and a motivation that is more elemental to the financial system. After a five-and-a-half year climb from the bottom of the worst economic and financial collapse in generations, it is difficult to unmoor complacency and convince market participants to cut exposure and feed speculative shorts. Yet, the recent scope of selling riskier assets and the tremendous rise in implied (expected) volatility herald a more motivated shift is building. Against record leverage, decades low participation and a cooling economic backdrop; investors are increasingly aware of the medium-term gap between price and value. As the motivation shifts from a modest ‘risk off’ to a more systematic deleveraging, liquidity becomes the primary concern for market participants. That leverages demand for US Treasury, money markets and the Dollar itself. It may take time to reach this intensity, but implications are acute and the structural deficiencies to our current situation large enough that it planning is important. As we await the mass’s verdict on the market’s course and potential, a few other factors should be considered while trading the Dollar. The first consideration is a recent flush of hope that the Fed could backtrack on its tightening regimen. This past week, St. Louis Fed President James Bullard – not a voter this year and more on the hawkish side with a recent call for a 1Q 2015 rate hike – turned heads when he suggested the FOMC should consider delaying its final Taper of QE3. His suggestion is more targeted towards tepid inflation, but the market in withdrawal and desperate for support reads it as a capital market boon. Realistically though, this isn’t a popular opinion and the Yellen sounded very confident of an October 29 final move at the last meeting. Furthermore, delaying a few months a scaled down stimulus isnt’ the same as an increase for encouraging risk trends. We will see little more on this topic with the media blackout period coming ahead of the next meeting. A final consideration for those trading the Majors: counterpart activity. This past week’s shudder in risk has clearly exposed the Euro-area’s troubles. Whether a trigger for global risk aversion or a direct counterbalance for the Dollar, this has considerable potential. We also have Chinese and UK 3Q GDP data on tap. 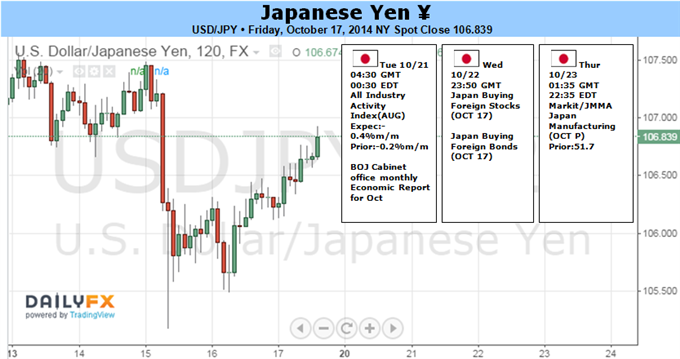 A lull in homegrown event risk will keep macro-level trends in focus for the Japanese Yen in the week ahead. The inverse correlation between the currency’s average value against its leading counterparts and the MSCI World Stock Index – a proxy for market-wide risk appetite – now stands at a hefty -0.72 (on 20-day percent change studies). That puts the Yen firmly into the “safety” side of the risk on/off asset spectrum and hints the currency stands to recover further as sentiment continues to sour. The central concern preoccupying investors is the ability of a resurgent US economy to underpin global growth, offsetting weakness in China and the Eurozone even as the Federal Reserve prepares to wind down the QE3 stimulus program later this month. A steady stream of high-profile economic data releases will help inform this debate in the week ahead, generating volatility for underlying risk sentiment trends and with them the Japanese Yen. In China, the third-quarter GDP figure is in the spotlight. Consensus forecasts put the year-on-year growth rate at 7.2 percent, marking the weakest reading since the post-crisis trough in the first quarter of 2009. Economic news-flow from the East Asian giant has increasingly deteriorated relative to expectations since mid-August (according to data from Citigroup). That suggests analysts are underestimating the degree of the unfolding downturn and warns that the realized GDP print may be even more dismal than forecasts imply. Turning to the Euro area, the preliminary set of October’s PMI figures is due to show the pace of manufacturing- and service-sector activity growth slowed for a third consecutive month, yielding the weakest results in 14 months. Adding insult to injury, the ECB seems resigned to complacency. Financial conditions in the region have deteriorated since mid-September even as the central bank introduced negative deposit rates and conducted its first TLTRO operation. In response, ECB officials have counter-intuitively used public speaking opportunities to play down expectations for the upcoming asset purchase program. 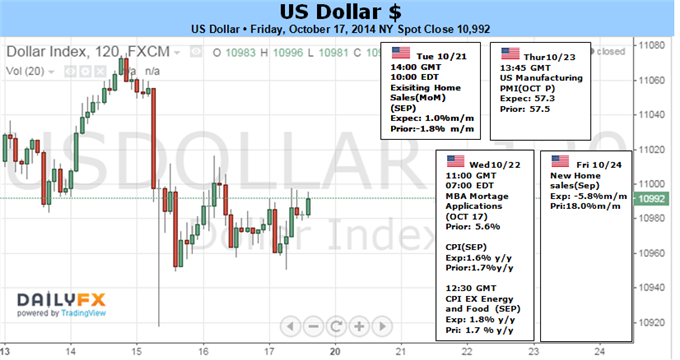 Finally, the US data docket is headlined by September’s CPI report. The headline year-on-year inflation rate is expected to slow to 1.6 percent, the lowest since March. However, leading survey data warns that price growth accelerated, with factory-gate prices rising at the sharpest pace yet in 2014 and service-sector output costs reaching a five-month high. That opens the door for an upside surprise, which would help rebuild 2015 Fed rate hike expectations. The prospect of tightening in one of the world’s three main growth hubs even as the other two decelerate bodes ill for risk appetite, amplifying liquidation of Yen-funded carry trades and helping the Japanese unit upward. 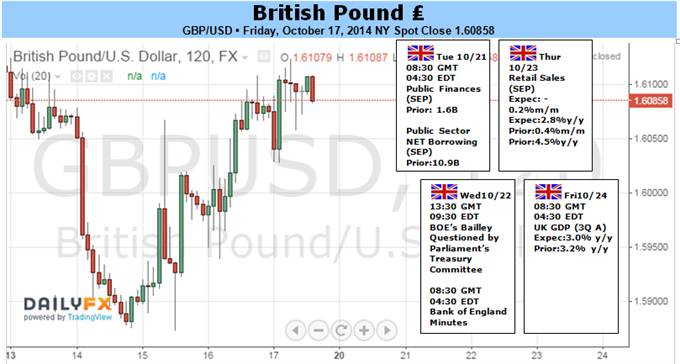 The British Pound may face additional headwinds in the week ahead should the fundamental developments coming out of the U.K. drag on interest rate expectations. Indeed, Bank of England (BoE) Chief Economist Andrew Haldane warned ‘interest rates could remain lower for longer’ amid the uncertainly surrounding the economic outlook, and the central bank may look to preserve the highly accommodative policy stance for an extended period of time especially as the Euro-Zone, the U.K.’s largest trading partner, faces a growing risk of slipping back into recession. As a result, the BoE Minutes are widely expected to show another 7-2 split, with Martin Weale and Ian McCafferty still voting against the majority, but the policy statement may highlight a more dovish tone for monetary policy as the headline reading for U.K. inflation slows to an annualized 1.2% in September to mark the lowest reading since 2009. At the same time, the 3Q Gross Domestic Product (GDP) report may undermine the BoE’s expectations for a faster recovery as the growth rate is projected to expand 0.7% after rising 0.9% during the three-months through June, and a marked slowdown in the real economy may generate fresh monthly lows in GBP/USD as market participants scale back bets of seeing higher borrowing costs in the U.K. Nevertheless, the technical outlook highlights a more meaningful recovery for GBP/USD as the Relative Strength Index (RSI) breaks out of the bearish momentum carried over from the end of June, and we will continue to keep a close eye on the ongoing divergence in the oscillator amid the string of lower highs in price. 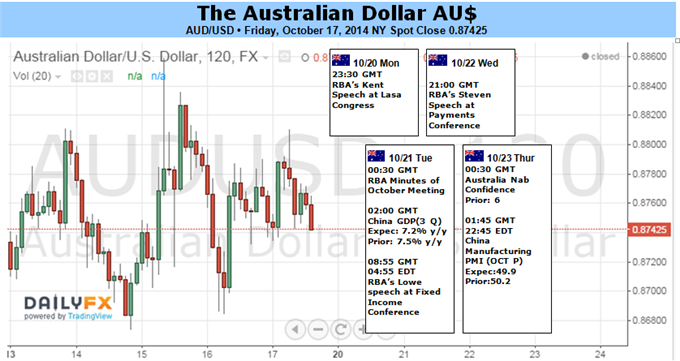 The Australian Dollar had another rollercoaster week against its peers as shifts in global risk sentiment swung the high-yielding currency wildly during intraday trade. Meanwhile, medium-tier regional economic data saw a lackluster response from the AUD amid well-anchored RBA policy bets. Looking to the week ahead, Q3 CPI figures headline the Australian economic calendar. Another deviation from expectations holds the potential to catalyze knee-jerk volatility for the currency. Yet follow-through is likely to prove difficult given it would take a significant surprise to materially alter rate expectations. Meanwhile, the RBA’s October Meeting Minutes and a speech from Governor Stevens (focused on the Australian payments system) are unlikely to offer fresh insights into policy makers’ thinking. In turn these may prove uneventful for the AUD. Elsewhere in the region, a raft of top-tier economic data from China is on the docket. The figures from the Asian giant could do little to dent steadfast Reserve Bank bets. Yet disappointing data from the world’s second largest economy may have the potential to feed mounting concerns over global growth and fan risk-aversion, which in turn would be a negative for the Aussie. The primary threat to the high-yielding currency remains the prospect of a continued surge in volatility, which according to some measures is at its highest since February. While many Aussie carry trades may have already been unwound short positioning in the futures markets remains well off the extremes of last year. This suggests there is plenty of room in the short trade before it begins to look ‘crowded’. Sellers appear intent on keeping the AUD/USD capped below the 89 US cent handle, leaving the risk focused on the 0.8660 barrier for the pair. If broken on a ‘daily close’ basis it could open the next leg lower to the July 2010 low near 0.8320. Gold prices pushed higher for a second consecutive week with the precious metal rallying 1.27% to trade at $1238 ahead of the New York close on Friday. The advance comes amid continued weakness in broader risk assets with all three major US indices down for a fourth consecutive week. Despite the risk-off environment, the key developments coming out of the U.S. economy may heavily impact gold prices next week after prices rebounded off key technical resistance mid-week. Federal Reserve speakers have continued their Dovish rhetoric as the FOMC eyes the overwhelming disinflationary risks associated with a premature rate lift-off. Indeed, St. Louis Fed President James Bullard, who won’t be a voting member on the FOMC until 2016, undermined the bullish sentiment surrounding the U.S. dollar as the policymaker saw scope to extend the QE exit and we may see a growing number of central bank officials show a greater willingness to retain the highly accommodative policy stance for an extended period of time amid the subdued outlook for inflation. As a result, the September consumer price index will largely be in focus next week, with consensus estimates calling for an uptick in the core reading to 1.8% y/y from a previous read of 1.7% y/y while the headline print is expected to downtick from 1.7% y/y to 1.6% y/y. With weakening energy prices, market participants may pay closer attention to the stickiness in core inflation as FOMC voting member Charles Plosser sees scope to normalize policy sooner rather than later. 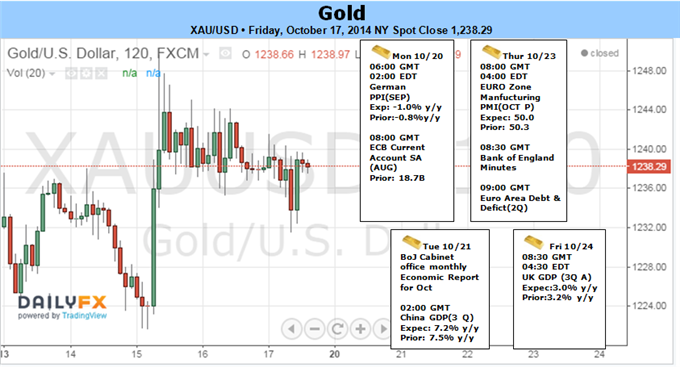 From a technical standpoint, gold tested and defended a key resistance level noted in last week’s update at $1243/44. This region is defined by the 38.2% retracement off the July high, the June close low and is the confluence of two pitchfork resistance lines. Although the broader outlook for gold remains weighted to the downside, we cannot rule out continued strength into the monthly close on account of the monthly opening range break which was validated this week. Bottom line: near-term the trade remains constructive while above $1222 with only a break sub-$1206 putting the bears back in control. A breach above $1244 eyes more significant resistance at $1260/63 and $1283 where ultimately we would start looking for favorable short entries. 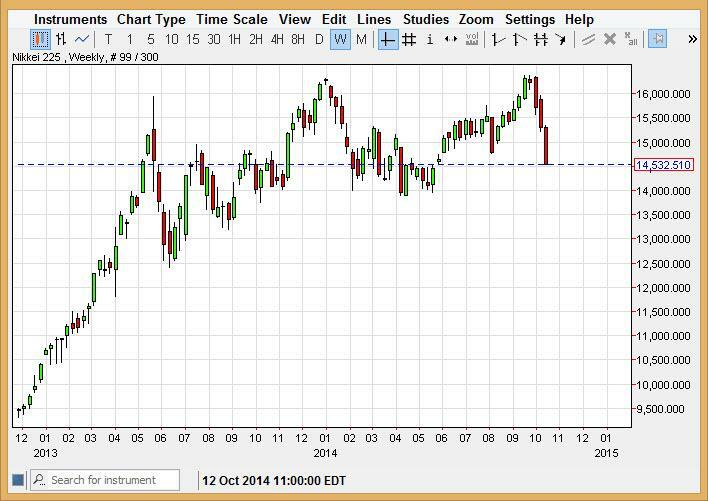 The Nikkei as you can see fell hard during the course of the week, breaking down below the ¥15,000 level. The ¥15,000 level was supportive, but we think that the ¥14,000 level is probably now the target. 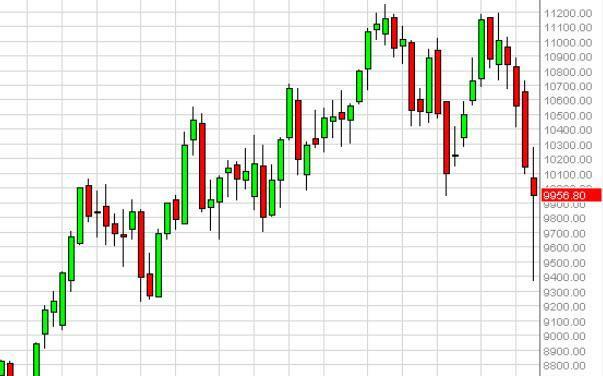 The question of course is whether or not we could get a longer-term trade to go that low. We think we can but the risk reward ratio isn’t worth it at this point for longer-term traders. With that, we will continue to monitor this market but traded from a shorter timeframe at this point. 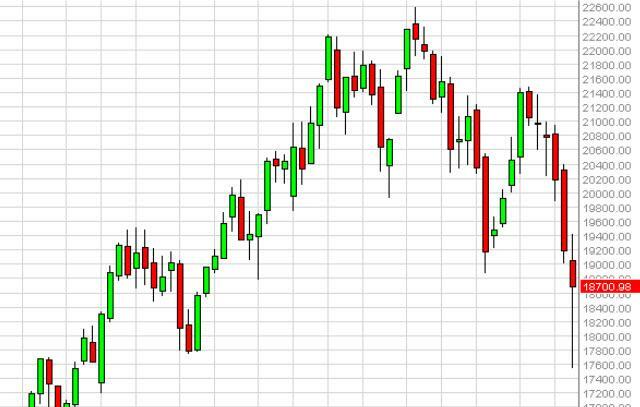 The DAX fell initially during the course of the week, but found enough support to turn things back around and form a nice-looking hammer for the week as the market now appears to have found buyers at the €8400 level. With that, we believe that a break above the top of the hammer, which is the €8900 level would be reason enough to start buying. On top of that, we have to keep in mind that the €8900 level was the bottom of recent consolidation, and if we get above that level we would reenter it. Because of that, we would love to start buying above that handle. The NASDAQ fell significantly during the course of the week as stock markets in general struggled. 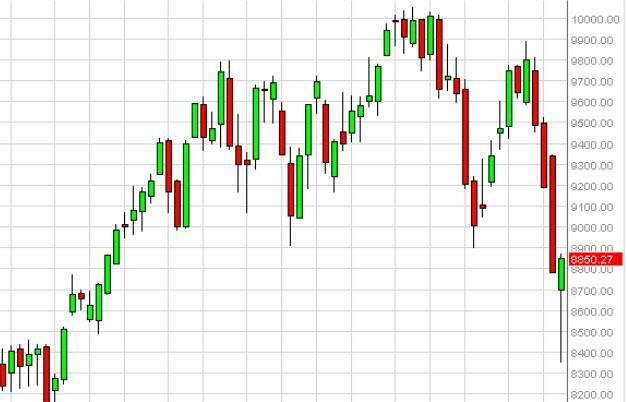 However, the market found enough support at the vital 4100 level to turn things back around and bounce. The bounce formed a nice-looking hammer, which sits just below the 4300 level. Because of that, we feel that this market could very easily go higher, if we can clear that aforementioned 4300 level. On that move, we would head to the 4600 level next in our opinion, and we believe that the uptrend would continue going forward. The NASDAQ does seem to have a significant amount of support starting at the 4100 level, but that also extends all the way down to the 3950 level. Because of this, we feel that the market is going to be held aloft buying the region that we just tested, so even if we pullback at this point in time we look at that as value more than anything else. In fact, it is not until we are below the 3950 level that we would consider selling this marketplace as that would signify a significant breakdown in the support system. Going forward, we feel that the 4600 level of course will be resistive, but if we can get above there it appears that the market could go much higher. 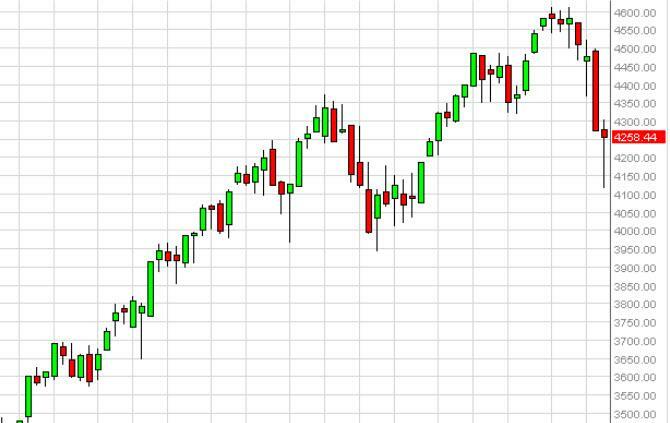 We feel that the market is probably heading to the 5000 level next given enough time, but keep in mind that it will of course be choppy and at the whims of headlines around the world. Because of this, the market looks very interesting at this point in time because the hammer is so perfect in its shape. Looking at the trend, it is a very gentle slope that we are calling the trend, and therefore it feels to us like there is still plenty of momentum to be had as the market should continue to see buyers step in as the market is far from been overbought, and we believe that will be the way this market moves going forward. The MIB fell initially during the course of the week, but like all of the other European indices, found buyers below to turn things back around and form a massive looking hammer for the week. The market sits just below the 19,000 level, an area that we have been looking at as potential support. That being the case, it appears that we have broken down significantly, binds if we can break the top of the hammer we feel that it will essentially be a “false break down.” With that, we would be buyers. The IBEX as you can see fell during the course of the sessions for the previous week. However, the €9400 level offered enough support to turn things back around and form a nice-looking hammer that is sitting just below the €10,000 level. With that, a break above the €10,300 level would be reason enough to start buying again as we should head to the €11,200 level given enough time. We think that pullbacks should continue to offer support as well, so we have absolutely no interest whatsoever in selling.